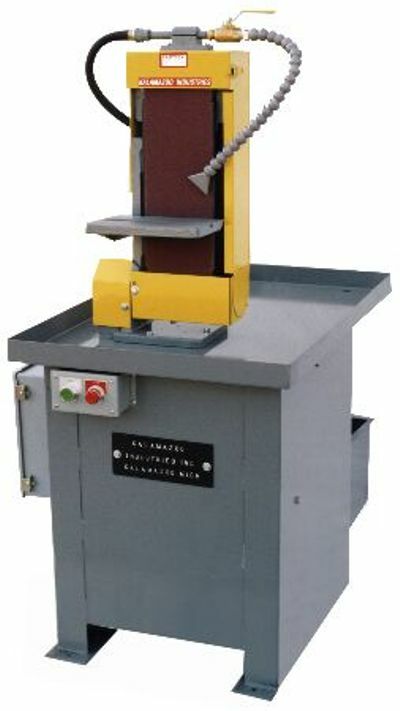 6″ x 48″ Wet belt sander, 3 hp, 1 ph/220 or 3 ph/220/440 motor, Also available in 50 hz, 575 volt too. Magnetic switch with 24 volt at pushbutton. 3450 rpm motor w/ 2800 SFPM at belt. Multi-postion vertical thru horizontal, cast iron frame. 1 lever quick belt change, pre-set spring belt tension. 1/3 hp coolant pump & 10 gal. tank w/ baffles. Model: S6MW-1, 3 hp , 1phase, 220 volt. WT: 475 lbs. Model: S6MW-3, 3 hp , 3 phase, 220 or 440 volt Wt: 475 lbs.